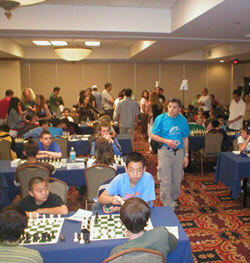 The United States Chess Federation - Junior Open Draws 118 Players! Home Page Chess Life Online 2007 June Junior Open Draws 118 Players! Junior Open Draws 118 Players! Watch selected games live on monroi.com! The Under 21 section is the smallest but very tough, with five USCF experts participating. Top seed Brian Goldstein scored a graceful attacking victory in round 2 against Scott Low. In the largest section, the U12, there are still five perfect scores: James Ukoli, Joshua Harrison, Haoqing Wang, Nicholas Rosenthal and Jared Lassner. In the Under 8, Miguel Hernandez and Eduardo Gonzalez lead with 3/3.